The Renault NC-31 is a Chinese tier 1 light tank. Una modificación del Renault FT con un nuevo chasis que utilizaba elementos de una suspensión de largo recorrido y una oruga de goma acolmillada Kegresse-Hinstin con zapatas metálicas. Esas características, junto con un motor mejorado de 45 cv, incrementaron la velocidad máxima a 16 km/h. Un total de 15 vehículos de este tipo se exportaron a China. 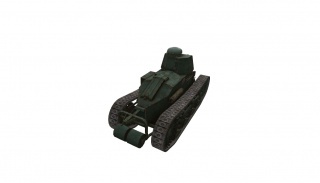 The Renault NC-31 is faster and more maneuverable than the Renault FT, while still having excellent weapons for its tier, such as an automatic 13.2mm machine gun or a 37mm gun, capable of hurting every tank that it sees, with the trade off of having a slightly longer aim time and not so great accuracy. It's a solid starter tank for new Chinese tree players. The Renault NC-31 leads to the Vickers Mk. E Type B, and the T-26G FT. Many will have a Tier-1 "Keeper" they enjoy playing, but it seems unlikely the NC-31 will grace many garages long term. However this tank could fit a niche style of play for those who enjoy low tier matches. The high maneuverability of this tank, plus the slope of the armor, cause the NC-31 to preform surprisingly well as the lead tank in a group fellow T1 tanks. Unlike its French counter part, the NC31 is built faster, and with better armor. It can deal a good bit if damage from close or long range. It has decent accuracy for a tier 1 and d/m. Please note the Map Restrictions for tier 1 tanks and the Camo Type for those maps when purchasing a camouflage skin/paint job for this tank. The only thing to unlock is the next gun. Two additional NC versions were produced for testing, the first of which appeared in 1927 and was designated the NC-1. The second version, the NC-2, appeared in 1931. The primary differences between the NC-1 and the NC-2 were in the turrets and armaments. The NC-1 carried the same turret as the FT and mounted a single 1918 model 37mm main gun. The NC-2 mounted an improved turret and offered twin coaxial mounted machine guns. Although Renault sought an export market for the NC, and did sell several units to foreign powers for testing purposes; the model did not realize success in France. Further development was discontinued by Renault in order to focus on the NC's successor the Renault D-1. 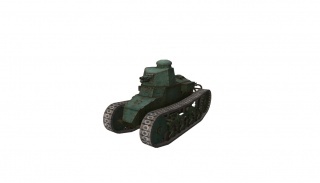 The NC31 is direct ancestor for the Renault D1 tank. 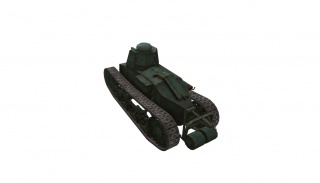 The French plan of 1926, calling for the creation of a Light Infantry Support Tank, led to the development of the existing Renault NC1 prototype into the Char D1. One hundred and sixty vehicles of this type were produced between 1931 and 1935. There was a pre-series of ten vehicles and later 150 standard vehicles were built. Until 1936 the vehicles were fitted with Renault FT turrets because the intended cast ST2 turrets were not ready yet. The ST2 turret was armed with a short 47mm SA34 tank gun with a coaxial 7.5mm MG. The hull carried a 7.5mm MG in the bow. The type did not serve as an infantry support tank as originally intended, but as France's major battle tank of the early thirties; it was quickly phased out in 1937 because of its mechanical unreliability. Development After World War I, France possessed a very large fleet of Renault FT light infantry support tanks. Although many of these were sold to other nations, over 2800 remained. In contrast to the United Kingdom, that after the war greatly reduced its armoured forces and scrapped any redundant AFVs, France maintained a large number of active or reserve armoured units (with an organic tank strength of about 1260) and all of the remaining Renault FTs were kept in working order. This implied that in the early twenties France had the strongest and most modern armoured force in the world, but this very fact led to a state of complacency. Development of new tank models was not seen as urgent, also because budgetary restraints would for the immediate future prohibit any further tank production anyway. When in 1922 General Jean Baptiste Eugène Estienne concluded an official study containing guidelines for long term tank design, no provisions were made for any new light infantry tank. However, the remaining Renault FT vehicles, though having shown themselves to be very effective in trench warfare, were in their present state of technological development not well adapted to peacetime conditions. The main problem was their low top speed, which necessitated the use of special tank transporters whenever the vehicles had to be moved outside of their base area and which made them fundamentally unsuited to patrolling duty in the colonies. It was therefore decided to modify a number of existing vehicles, by fitting them with a more effective suspension system. 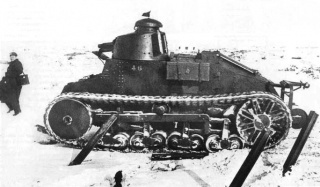 The first modifications were of the Renault FT Kégresse-type, which featured the suspension of the Kégresse half-track, fitted with a special rubber steel-reinforced track. In 1925 42 vehicles were rebuilt this way and deployed in 1926 during the Berber insurrection in Morocco. The modification allowed for a top speed of 17 km/h but field experience showed that the track was liable to suddenly snapping at top speed with often catastrophic consequences and the modification project was therefore discontinued. Nine Renault FT Kégresse vehicles were later sold to Yugoslavia and five to Poland. Meanwhile Louis Renault had obtained an order in 1923 to build two new prototypes as a parallel modification project, with the factory designation Renault NC; it was intended to feature not only an improved suspension system but also a stronger engine. Like "FT", "NC" is simply a combination of code letters devoid of any meaning. One prototype happened to be finished second, in December 1925, and was therefore called the NC2. It was fitted with a strongly modified Kégresse leaf spring suspension and a 62 hp engine. It had as an alternative designation Renault Modèle 24/25, because Renault proposed to build it as a possible "fast tank" as specified in Plan 1924 of the French Cavalry. This line of development was discontinued however. The first prototype to be ready, thus named the NC1, had a completely different suspension system, with twelve wheels and three large vertical volute springs per side. It allowed for a top speed of 18.5 km/h, making it in 1926 the fastest French tank ever. As had been the case for the Renault FT Kégresse, this project was still primarily intended to merely result in a modification proposal to rebuild existing Renault FTs. In 1926 it transpired however that the Char de Bataille project, that much later would result in the Char B1, was evolving into a far heavier tank than at first intended. It would be impossible to procure this heavier design in sufficient numbers and therefore specifications were made in the Infantry Plan 1926 for a new Char léger d'accompagnement d'infanterie, a "light infantry support tank". Renault immediately tried to offer his NC1, now called the Renault Modèle 26/27, as the logical candidate for this role. Renault also tried to open foreign markets. In 1928 he sold a single NC prototype to Sweden, in that country named the Stridsvagn fm/28; in 1929 he obtained an order of ten vehicles for Japan, there called the Renault Otsu-Gata ("Type B"); and 24 more were according to some sources delivered to Poland, fitted with 25 mm side armour, bringing the weight from 7.5 to 9.5 metric tons. 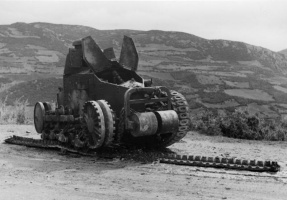 In the early thirties a single tank was delivered to Greece. All of these vehicles were by postwar writers subsumed under the name NC27; this was not a contemporary designation, however. 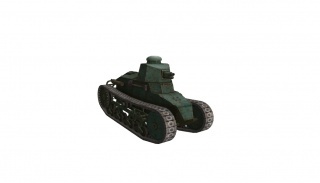 In 1928 Renault succeeded in his attempt to get his Renault NC accepted as the basis for further light infantry tank development; he was granted an order to build two prototypes. The Army called this project the Char D, Renault used the designation NC28. Of the two prototypes, the first was fitted with the twin machine gun turret of the SRA Char de Bataille prototype. Also a new suspension system was tested incorporating the special chenille légère ("light track") designed by Colonel Balland, which was optimised for high speeds. As this vehicle was a derivative of the NC1, it was later indicated with the designation NC2, creating confusion with the earlier project of that name; many later books assumed they were one and the same vehicle. The Army made a choice in March 1929 for the second prototype, the NC3 gun tank, and ordered a pre-series of ten vehicles in December 1929. These had the Renault factory designation NC31, after the intended year of delivery. Renault merely had to build the hulls at a price of 400,000 FF each; the cast turrets were, as usual in France, separately ordered with the Schneider company; they were of the ST1 type (Schneider Tourelle 1). As this turret was much wider than the Renault FT turret used on all previous NC models, Renault broadened the hull accordingly; the typical tapering nose point of the Renault FT was abandoned. The ten hulls were delivered between May and November 1931: after an interval of ten years after the delivery of the last Char 2C in 1921, French tank series production for the home market was thus resumed. The ten pre-series hulls were tested by the 503e Régiment de Chars de Combat. Many shortcomings were discovered by the Commission de Bourges, the French Infantry matériel commission. Steering was difficult, the suspension too weak and the exhaust pipes overheated the engine compartment. Nevertheless the type was accepted for mass production — the commission had little choice in this as the main series had already been ordered — provided that changes were made. The strangely squeezed ST1 turret, the first ten of which were delivered from November 1930, was rejected though as being unacceptably cramped and unbalanced. To prevent that each time the gun was loaded, the breech had to be lowered into the fighting compartment or otherwise the round could not be shoved in, the main armament had been placed in a very forward position. The ST1 turrets were therefore again removed from the first ten vehicles. On 23 December 1930 a first order of 70 main production series vehicles was made, followed on 12 July 1932 by a second order of 30; the last order on 16 October 1933 was of 50 vehicles, for a total of 150, delivered between January 1932 and early 1935, at a price of 375,000 FF per hull. Including the NC31s the series numbers were 1,000-1,160. The factory designation was still Renault NC. The series vehicles had many improvements: a Cleveland differential; a 74 hp instead of a 65 hp engine; the exhaust pipes were placed to the right, no longer crossing the engine room and there were support rollers fitted to prevent resonance in the top track run. Finally, the fuel tank was enlarged to 165 litres and a new radiator was fitted. In May 1930 Renault was asked to develop two derived types, the Char D2 and the Char D3; the original Char D now received as designation Char D1. Bingham, J., 1973, AFV Weapons Profile 59 - French Infantry Tanks Part II (including R 35 and FCM 36), Profile, Windsor, UK, 24p. Hara, T., 1972, AFV Weapons Profile 49 - Japanese Medium Tanks, Profile, Windsor, UK, 24p. 1925 CHAR RENAULT NC at chars-francais.net Photos, specs, and brief history in French.